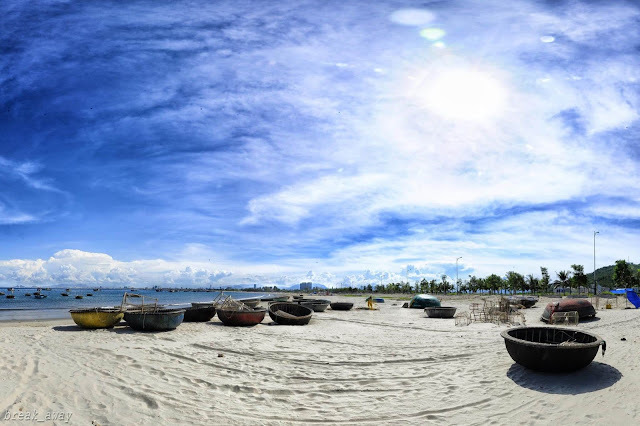 My Khe Beach Danang has become one of the "signature" for the coastal city of Da Nang. With a wild and charming look, My Khe has become a hot spot for tourists during this time. And so far, that "fever" has not yet stopped. My Khe - an impressive destination not only attract the attention of domestic visitors but also international tourists. My Khe has reached the top six of the most beautiful and seductive beaches on the planet by prestigious Forbes magazine and is among the top 10 most popular Asian beaches in the world by the Australian Sunday Herald Sun. So it is not surprising that My Khe has become one of the most popular tourist destinations in Da Nang. My Khe beach is extremely convenient, just 3km to the east of the city center. So visitors can easily move to My Khe by various means. From Danang city, tourists can choose to travel by taxi, bus (Danang - Hoi An line stopping at My Khe beach) or renting motorbike taxi. The smooth white sand stretches, the gentle blue water flowing smoothly and the coconut cheerful in the wind ... are impressive images when talking about My Khe. The green and seductive beauty of the sea of My Khe can easily take your heat away. Who have ever come to My Khe or simply watching My Khe through the beautiful images on the page, newspapers ... are longing for a once experience, immersed in the beautiful scenery My Khe. My Khe sea water is mild and green throughout the year, so visitors can visit at any time. Besides the summer season (the most beautiful time of Da Nang seaside), autumn, spring or even winter are also excellent suggestions for visitors. With its own unique season, visitors will be able to admire the beautiful scenery and experience a variety of different emotions about the planet's most beautiful beach. Many visitors shared that My Khe is really charming with blue seawall, four seasons, soft white sand, a clear atmosphere and lots of fun activities. So many visitors spend a full day on their 3-day Da Nang tour for My Khe beach. ➤ Why don't you join us to experience the Top-Ranking Beaches in Vietnam from North to South in only 1 tour? If you visit the coastal city, go to My Khe to experience the beauty of peace, charm, harmony with nature and cool water. Guests will feel refreshed and pleasant, forget the sorrows in life. Pham Van Dong beach center: located in the park, so Pham Van Dong beach is quite compact and very convenient location. T20-T18 Beach: Previously this beach was built by the US military entertainment area for soldiers. Especially, the beach is very close to Non Nuoc tourist site, so you can combine your trip to My Khe to visit Da Nang fine art handicraft village and some tourist spots around. 1-2-3 Beach: The main beach of My Khe, which is invested in various types of services and high safety. 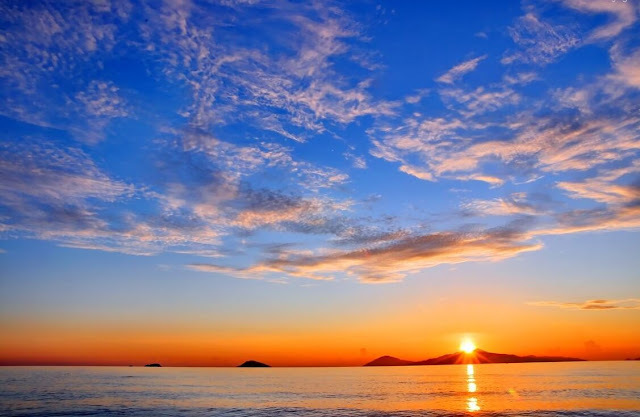 Beside bathing, a wonderful experience that visitors do not miss when visiting My Khe is watching the sunrise - sunset here. My Khe dawn is clear and tranquil while My Kha sunset is quiet and romantic with red light. At the end of the day, the sun descends like a flaming fire", a vast sea is beautifully dyed red. Waves rippling echo echoing the soul peace and quiet. Walking on the beach and feeling the changes of the day will definitely be a memorable experience for visitors. 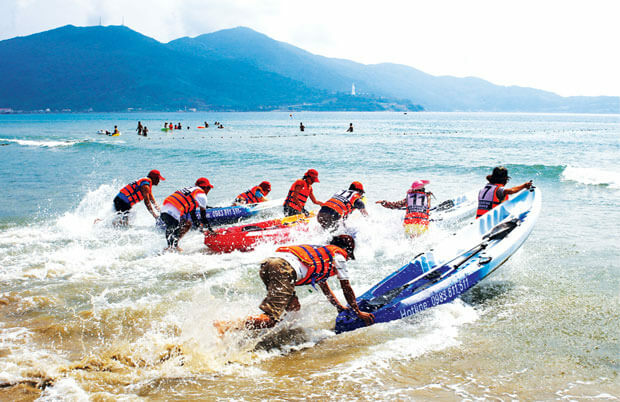 In addition, recreational activities such as fishing, snorkeling or surfing, yachting and jet skiing are all very interesting games at My Khe beach that visitors should experience. It is my pleasure to introduce to you My Khe - one of the attractions of Da Nang tourism is extremely attractive. And we hope that through the short article,you will have more "motivation" for a trip to Da Nang beach to beautiful dreamy My Khe beach.